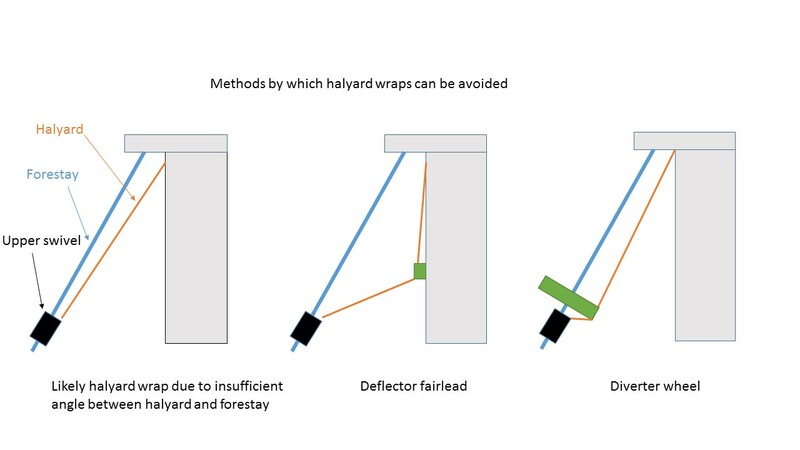 A halyard wrap is the term used to describe the situation in which the headsail halyard winds itself around the forestay, ultimately causing the forestay to fracture. The fundamental cause is that the angle between the forestay and the halyard is less than about 10 – 15 degrees, which provides insufficient lateral force to the upper swivel to keep it stationary when the furling line is pulled. It is then easier for the halyard to wrap around the forestay. However, the same problem will occur if the headsail is furled or unfurled with the halyard loose, even if the angle between the two is sufficient. A furling line should never need to be hauled in with a winch. Always check the cause of the problem if extra force seems to be necessary. In most cases the halyard sheave and the forestay terminal are fairly close together, meaning that the stay and halyard are almost parallel at the top swivel. There are two principal means by which the angle is increased, either a diverter or a deflector. 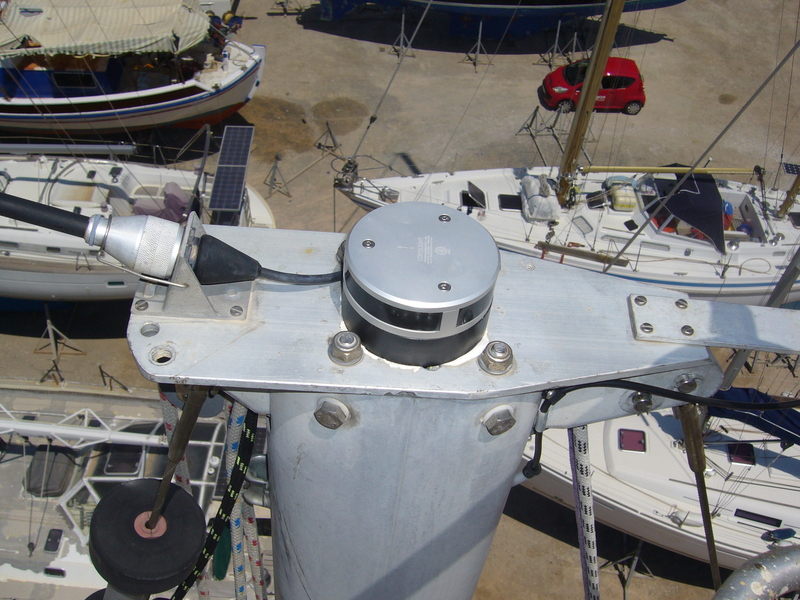 A diverter is a bullseye fairlead riveted to the mast some way below the halyard sheave. A deflector is a small wheel with its own bearing, fitted above the top swivel. Both increase the angle between the stay and halyard, ensuring that the upper swivel remains stationary. 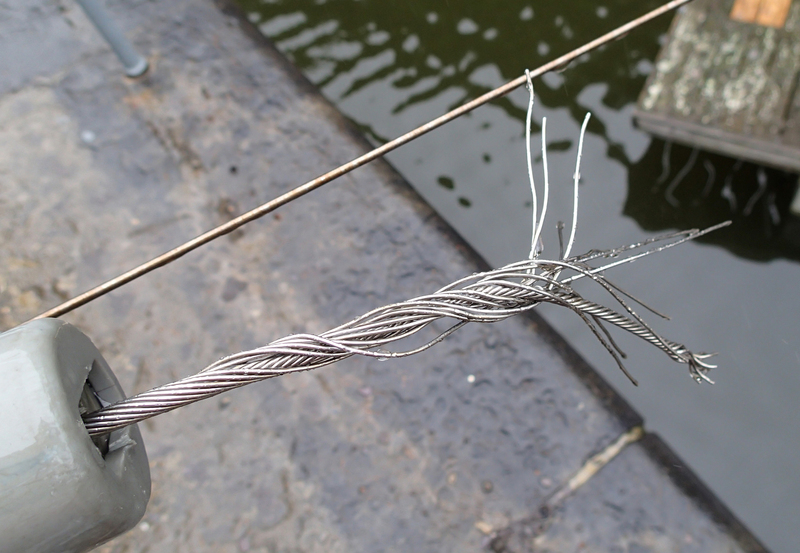 A failed forestay due to halyard wrap, with the genoa foil on the left. 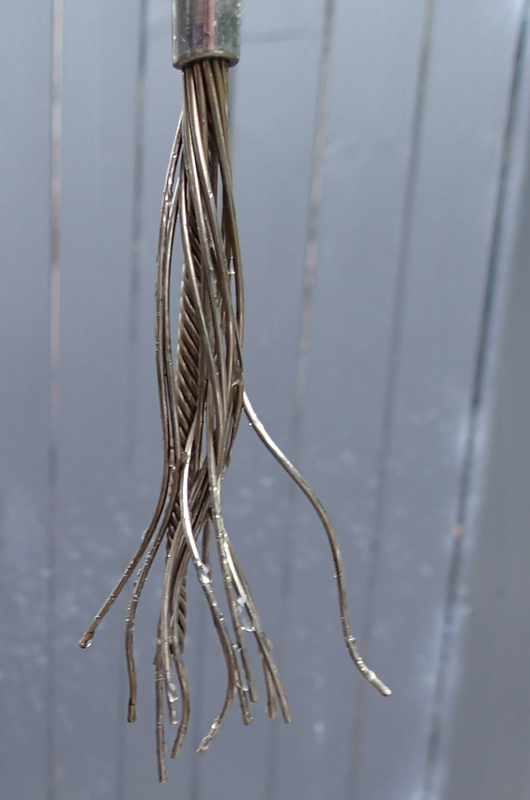 Note the tight turns of the inner wires, tightened hard by the furler, possibly with the assistance of a winch, whereas the outer wires, wound in the opposite direction, have straightened. The masthead swaged terminal with a short length of failed forestay. One of the ways in which the angle between forestay and halyard can be increased. A diverter wheel located above the upper swivel, as supplied on a Facnor furling system. The deflector bullseye fairlead used previously is also visible.